Silex manufactures customer specified molded parts on modern injection molding machines. Silex produces medium and large batches of molded parts on modern injection molding machines. In production, we use the classic HCR silicone rubbers, which are compounded in-house, and LSR liquid silicone rubbers, which are especially suitable for large batches of parts. 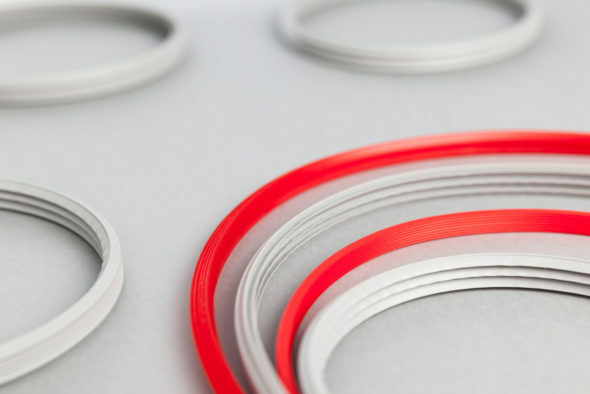 In addition to the standard rubbers with a wide variety of properties and Shore A hardnesses of 10-90, special silicone rubbers can also be used in low temperature applications (PMVQ) and fluorosilicone rubbers (FMVQ) for applications where there is contact with gasolines, oils, and organic solvents. Excellent resistance to hot air (special compounds up to 300°C). Very good UV, ozone, and weather resistance (without anti-aging agents). Lowering of the coefficient of friction by modifying the surface (less dull rubber). Labeling (laser / stamping / embossing).